Attorney Stephen L. Jones says the Massachusetts drunken driving statute is the only law that permits a person accused of a crime to be penalized without being convicted. Stephen Jones offers no apology for the way he makes his living. The Norwell attorney defends 100 to 150 accused drunken drivers every year. 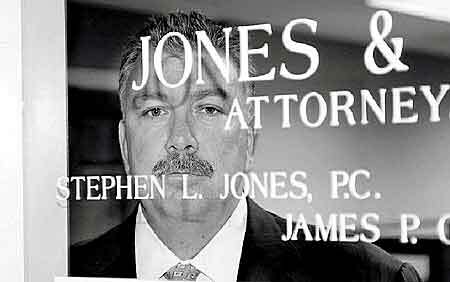 He even has a web site devoted to telling prospective clients what to do if they are arrested. First on his list? Call a lawyer. "There are a lot of people arrested who shouldn't be convicted," said Jones, who is on the board of regents of the Houston-based National College for DUI Defense, an educational organization. "That's why ... I take on these cases. It's important for people to understand that not all of those arrested are guilty." While some people say Massachusetts should strengthen its drunken driving law, Jones and other defense lawyers say the law goes too far already. It is, they say, the only law that permits a person accused of a crime to be penalized without being convicted, something that happens every time an accused driver refuses to submit to a field sobriety test or take a police-administered blood alcohol breath test. It is also the only crime for which someone can be convicted solely on the testimony of one police officer, he said. "You have an opinion from an officer that arrested you, and many times that's the only evidence," he said. During the past two years, the terrain for drunk drivers - and their attorneys - has become even less forgiving. Last year, the Legislature passed the so-called "lifetime look-back" law, which puts a defendant's entire record, rather than just the past 10 years, into play for prosecution and sentencing purposes. Lawmakers also passed the "per se" law, which defines a blood-alcohol level of .08 as irrefutable proof that a driver is drunk. Before the law took effect, drunken driving defendants could argue to a jury that they were not intoxicated despite having a .08 blood alcohol level. Prosecutors, lawmakers and Mothers Against Drunk Driving officials hail the measures as some of the most important tools for fighting drunken driving. "These two laws will make a major difference as far as prosecution and enforcement," Norfolk County District Attorney William Keating said. "They will have an effect and already have." But Quincy attorney Jack Diamond says the law makes criminals out of people who intend no harm. "It's probably one of the most complex criminal charges out there that affects non-criminals," Diamond said. "No one drinks, gets in a car and intends to hurt anyone." He said the "lifetime look-back" law will mean longer sentences for people who may have had clean records for more than a decade. Diamond sees that as unfair. So do others, including Judge Mark Coven, the presiding justice at Quincy District Court. Coven said offenders who have stayed out of trouble for a decade shouldn't be faced with a jail sentence for a drunken driving conviction when they were in their 20s. "Do you want to take a person away from his family and put him in jail for a year?" Coven asked. Jones says field sobriety tests are unreliable, yet a person can expect to be arrested for failing one. "...It is the only test that you have to get 100 percent to pass," he said. "If you can't stand on one leg for a count to 30, you will be arrested." He recommends against taking the breath analysis or field sobriety tests, even if it means an automatic loss of license. "The only thing you need to do is give the officer your license and registration," he said. Staff reporter Dan DeLeo contributed to this story.